A rendereing showing an aerial view of the new sports complex in Attleboro called New England Sports Village. 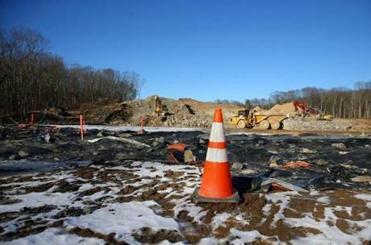 Last September, a small army of workers with bulldozers, backhoes, trucks, and other heavy equipment finally began clearing a portion of a 140-acre wooded area that Attleboro officials had long eyed as the site of a future industrial park. In coming weeks, private developers plan to start pouring the foundations of four buildings totaling nearly 400,000 square feet of space. But the site, tucked just off Interstate 95 near Rhode Island, isn’t going to host warehouses, light-manufacturing, or other facilities commonly associated with suburban industrial parks. Instead, the site will be the home of the New England Sports Village. Spurred by the rapid growth of paid youth sports programs across the country, New England Sports Village’s developers plan to build a 47,000-square-foot aquatics center; a 100,000-square-foot ice arena; a 165,000-square-foot indoor field house; a hotel with up to 150 rooms, along with retail and restaurant space. 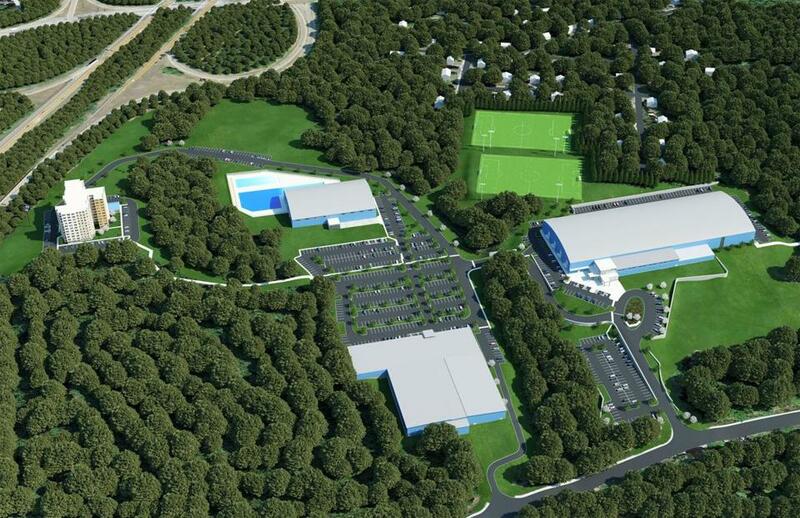 If all goes well, the New England Sports Village would become, after its expected completion in September 2017, the largest privately developed and operated youth sports complex in the state, according to its backers. It would also feature the widest variety of facilities. Ground has been broken in Attleboro for the New England Sports Village. Ultimately, developers hope to fully lease out facilities, at a profit, to thousands of customers, usually the parents of young athletes who are playing in the increasing number of “speciality” youth sports leagues around the country, from hockey to soccer to swimming. The facilities will also play host to paying high school, college, and adult sports programs in need of modern, year-round facilities. A number of massive, privately financed sports complexes have already sprouted up across the country in recent years, as the business side of amateur youth sports has exploded into a $7 billion industry. In 2012, a group of developers spent $50 million to open the Chelsea Piers Connecticut complex in Stamford, a 500,000-square-foot indoor facility with hockey rinks, an Olympic-size swimming pool, squash and basketball courts, and other amenities. The complex is owned by the same development team that rebuilt New York’s Chelsea Piers into an one-million-square-foot film production and athletic complex. In 2014, developers opened the Spooky Nook Sports Complex in Manheim, Pa., touted as the largest indoor multisports center in North America at more than 600,000 square feet. It’s not just private developers jumping into the sports-complex market. In Massachusetts, a number of municipalities, no longer willing to pay for the construction or maintenance of expensive sports facilities, have teamed up with private developers to build and operate facilities. The latest is in Braintree, where town officials and Five Capital Management are hammering out details for a potential 160,000-square-foot, $20 million sports center on five acres of public land next to Braintree High School. The town plans to lease the land to Five Capital Management, which would put up most of the money to build and operate an indoor ice rink, swimming pool, and artificial-turf playing field. But the Braintree project and similar public-private ventures are small compared to New England Sports Village. In Attleboro, the city’s prime motive was to unload a long unused property that was costing the Attleboro Redevelopment Authority about $5,500 in monthly mortgage interest payments. Since the early 1990s, Attleboro had owned the land and hoped to develop it into a traditional industrial park. After numerous setbacks, the city decided to look at other options, including a new sports complex modeled after other privately-financed facilities, said Rick Correia, chairman of the Attleboro Redevelopment Authority. Enter Fitzpatrick, an Attleboro resident and former owner of a commercial real estate advisory firm, and David Boucher, a North Attleborough resident and former partner at a small financial-services company. Their children played hockey together and the two fathers often discussed the possibility of one day developing a for-profit youth complex. Last spring, the city agreed to sell 104 of 140 acres to Five Capital, co-founded by Fitzpatrick and Boucher, and other investors for $2.34 million, with an option to buy the rest of the wooded area later. Though the land has been valued as high as $4 million, Correia said the city was eager to see the property finally developed after so many years. “It’s a win-win situation for both sides,” said Correia, noting the city will reap tens of thousands of dollars a year in property taxes, while developers get land at an affordable price. Fitzpatrick and Boucher say they’ve lined up other investors, though they declined to identify them. They’ve already signed up tenants for their two NHL-size hockey rinks, including the Johnson & Wales University women’s hockey team, Lovell Hockey (which currently runs three paid hockey programs in the area), the Attleboro and North Attleborough high school hockey teams, and other youth and adult hockey programs. Meanwhile, the Bluefish Swim Club, which trains competitive swimmers, will soon call the future aquatics center its home.